Sealed Item rate quotations are invited on behalf of the Indian Red Cross Society for an estimated cost of Rs.3,14,566.00for the work of Repair and Maintenance of Staff Quarters at Sarojini Nagar, New Delhi, as per schedule of quantities and Special Conditions of contract, in addition to general conditions being followed in IRCS which can be seen in the office for quoting your competitive rates for the same. 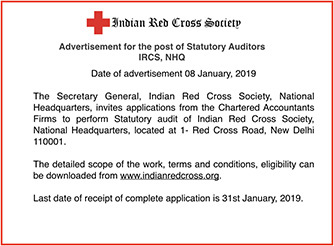 The Seceretary General, Indian Red Cross Society, National Headquarters, invites applications from the Chartered Accountants Firms to perform Statutory audit of Indian Red Cross Society, National Headquarters, 1- Red Cross Road, New Delhi – 110001. The detailed scope of the work, terms and conditions, eligibility can be downloaded from the it’s website www.indianredcross.org. Last date of receipt of complete application is 31st January, 2019. 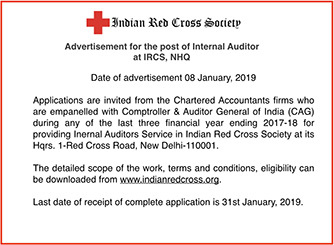 Applications are invited from the Chartered Accountants firms who are empanelled with Comptroller & Auditor General of India (CAG) during any of the last three financial year ending 2017-18 for providing Inernal Auditors Service in Indian Red Cross Society at its Hqrs. 1-Red Cross Road, New Delhi-110001 at a total remuneration to be quoted by the firm. At present the Indian Red Cross Society is paying annual remuneration of Rs.2.00 lakhs (appxox.) for the work. The detailed scope of the work can be downloaded from the Indian Red Cross Society website www.indianredcross.org. Applications alongwith the quotation for consolidated fees for the Internal Audit work per year, in a sealed envelope complete in all respect superscribed as “APPLICATION FOR INTERNAL AUDITOR” must reach on or before 31st January 2019 addressed to Secretary General, Indian Red Cross Society, National Headquarters, 1-Red Cross Road, New Delhi-110001.